These easy lasagna roll ups with fresh vegetables, a light tomato sauce and cheese are a must make. Make them now or prep and freeze for later. Jump to the Fresh Vegetable Lasagna Roll Ups Recipe or read on to see our tips for making them. These meatless, yet hearty roll ups are inspired by our popular veggie lasagna. After reading all the great reviews, we knew we needed to share this easy and fun spin. Make these for a crowd or freeze and bake them one at a time for single serving dinners. YOU MAY ALSO LIKE: See where the inspiration for these roll ups came from. 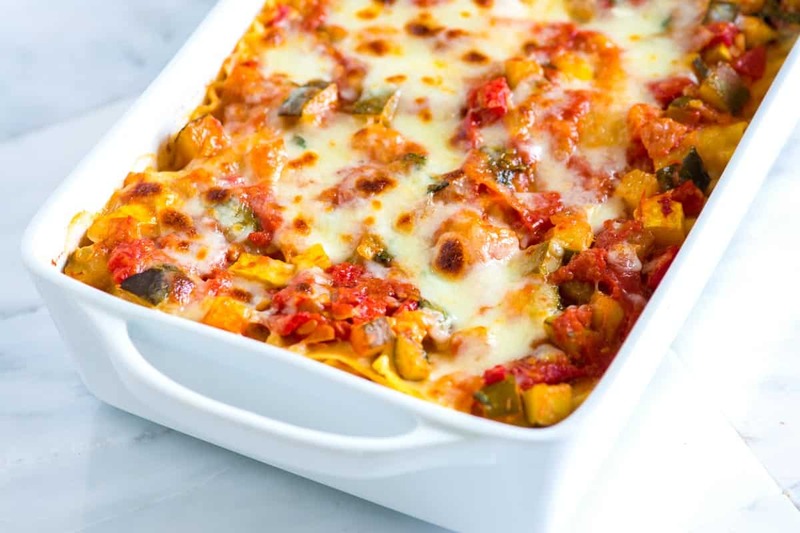 See our original fresh vegetable lasagna recipe with lots of great reviews. See the recipe and video now. These veggie roll ups are meat-free, light and easy to make. Let me show you how we make them. The vegetable laced sauce for these comes straight from our original recipe. In that recipe, we chop the veggies up small. We tried this for the roll ups, but the veggies kept falling out. The solution? We swapped chopped vegetables for shredded. 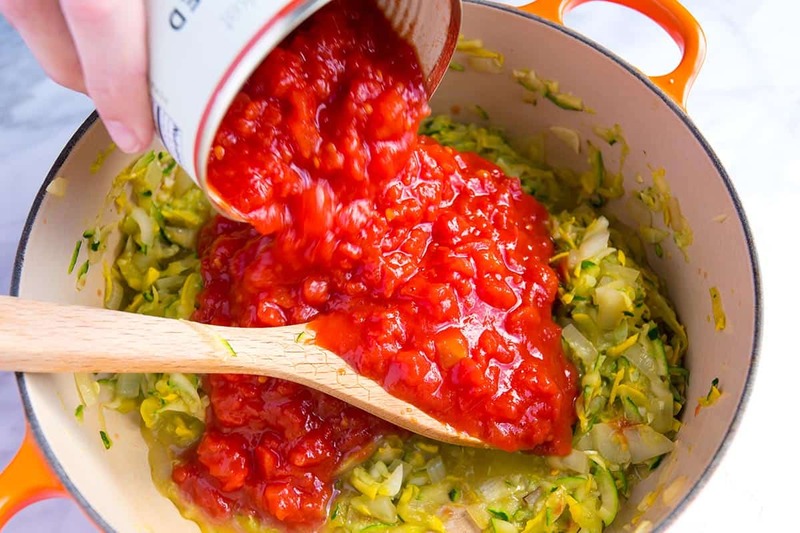 By shredding the vegetables, the sauce stays spreadable and the prep time goes quickly. We use our box grater for easy clean up, but a food processor with a grater attachment also works. For the vegetables, we use onion, garlic and zucchini (or summer squash). 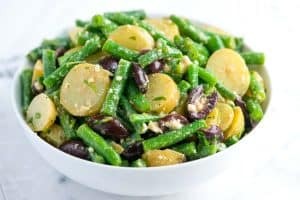 You could easily add other vegetables if you have them. Roasted peppers, mushrooms or or greens like spinach or kale would be excellent. You could even swap the sauce for the same sauce we use in our easy spinach and mushroom lasagna. I should also mention that getting rid of the tomato sauce completely is an option. Try spreading a layer of basil pesto over the cheese or increase the nutrition with this kale and almond pesto. 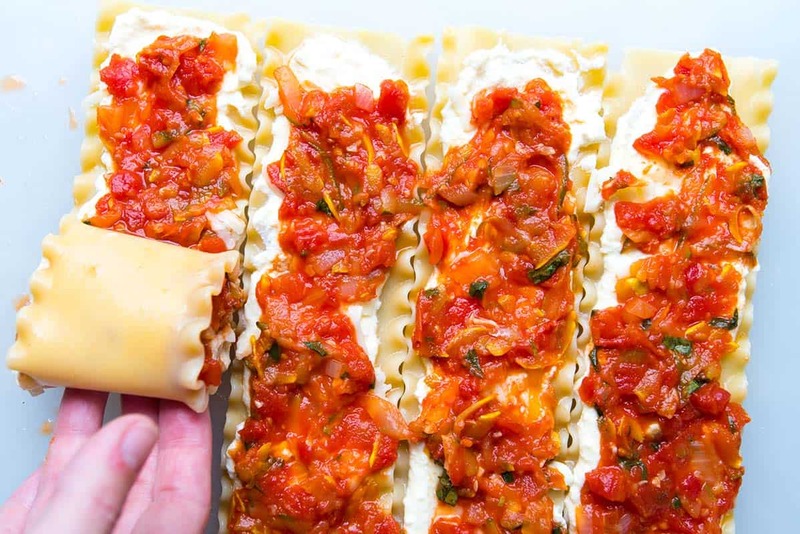 For the middle of the roll ups, we spread ricotta cheese (cream cheese would be a good substitute), add shredded mozzarella cheese and finish with the vegetable sauce. When it comes to rolling up, don’t worry if a little sauce or cheese falls out the sides. I found the easiest method was to use two hands and gently roll up. Then, cradle the whole roll up as you place it seam-side-down in the baking dish. If any filling falls out, just sneak it back in with a spoon or add it to the bottom of the baking dish. These are freezer friendly and can be made in advance. Check the recipe below, we’ve shared lots of tips for making them ahead of time. For more veggie-based recipes, take a look at our Easy Baked Ziti with Spinach and Artichokes, this Butternut Squash and Pesto Pizza, this hearty Kale and Bean Salad with Tahini Sauce and these Roasted Veggie Tacos. Shredding the zucchini keeps the filling spreadable and makes quick work of vegetable prep. We use a standard box grater, which gets us from whole zucchini to shredded in no time. 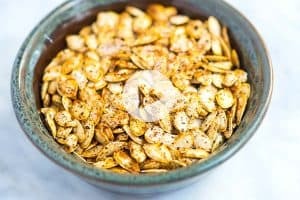 Using a food processor grater attachment is also a good idea. These are freezer-friendly and can be made in advance. Check the notes below the recipe for our tips. Bring a large pot of salted water to the boil then cook lasagna noodles according to package directions. Drain then lay flat on a sheet of aluminum foil or baking sheet. Heat olive oil in a wide skillet with sides over medium heat. Add onion and cook, stirring occasionally until translucent; 3 to 5 minutes. Add garlic, red pepper flakes, zucchini, and a pinch of salt then cook, stirring occasionally until softened and most of the liquid from the zucchini has evaporated; 5 to 8 minutes. Stir in the crushed tomatoes. Bring to a low simmer and cook until the liquid has thickened and reduced by half; 5 to 8 minutes. Add the basil and season to taste with additional salt and pepper. 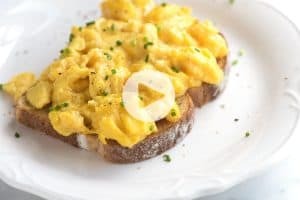 Stir ricotta, eggs, and a pinch of salt in a medium bowl until blended. Heat oven to 350 degrees F. Lightly oil a 13-inch by 9-inch baking dish or spray with non-stick cooking spray. Spread 1 cup of the vegetable sauce in the bottom of the baking dish then set aside another cup of sauce for spreading on the top of the roll ups before baking (we keep it in a measuring cup). 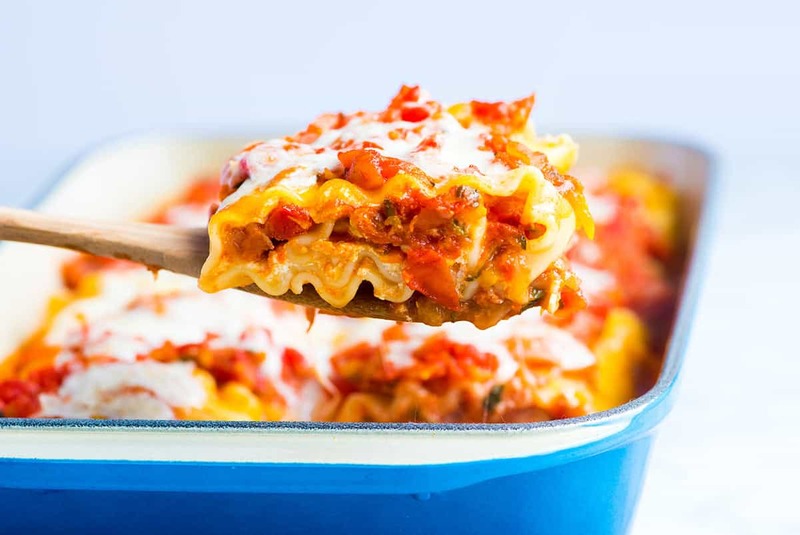 Divide the ricotta cheese mixture between the 8 lasagna noodles and spread into a thin layer. Set one-third of the mozzarella cheese aside for adding to the tops of the roll ups before baking then scatter the remaining two-thirds of cheese over the ricotta layer. Divide the remaining vegetable sauce between the lasagna noodles, spreading it thin on top of the cheese. There should be about 1/4 cup for each noodle. Gently roll each lasagna noodle up and place seam-side-down in the baking dish. Don’t worry if some of the filling spills out the sides, you can always spoon that back into the dish or sneak some into the sides of the roll ups if you need to. Spread the reserved cup of sauce over the roll ups and scatter with the remaining mozzarella cheese. Loosely cover with aluminum foil then bake 20 minutes. Remove the foil and bake, uncovered, until the cheese is bubbly and starting to brown, about 10 more minutes. 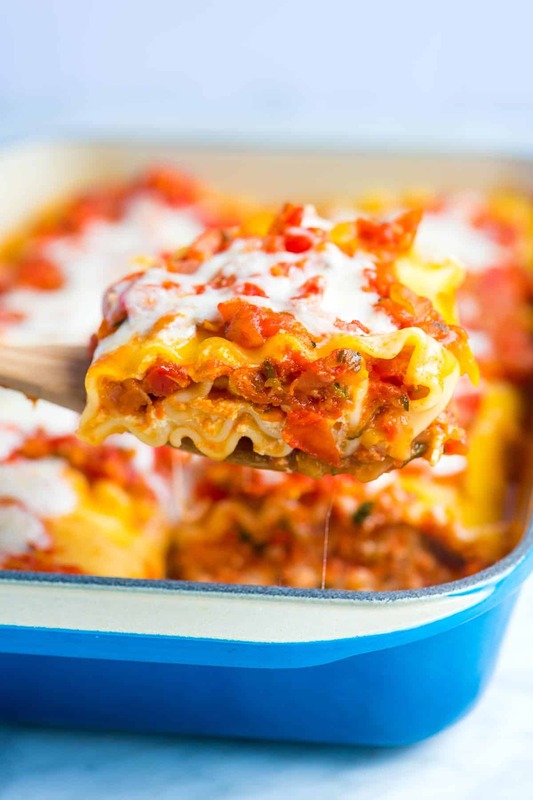 Lasagna roll ups are freezer friendly and can be baked individually. Fill each lasagna noodle as shared above, but instead of lining the baking dish with some of the sauce, leave that out. Instead, place the roll ups, seam-side-down, into the lightly greased dish so that they are not touching each other. Cover loosely then freeze about 1 hour or until mostly frozen. When you are ready to bake, spray a baking dish with nonstick cooking spray or lightly oil, place one, two or more of the frozen roll ups into the dish, cover then thaw in the refrigerator 8 hours or overnight. When thawed, heat the oven to 350 degrees F, spoon some of the sauce (or use jarred pasta sauce) around the roll ups, cover and bake 20 minutes. Uncover then bake an extra 10 to 20 minutes until the cheese is bubbly. For more make-ahead tips, see the notes below. You can cover and refrigerate the unbaked roll ups up to 2 days. When you cover, use parchment or wax paper between the lasagna and aluminum foil. Aluminum foil can react with the tomatoes. The vegetable sauce can be made in advance and should last in your refrigerator up to 3 days and in your freezer for about 3 months. We recommend using freezer-safe glass containers, or double layers of freezer bags to store sauces. To thaw, simply leave it overnight in the refrigerator. Baked roll ups also freezes well. Let it cool completely on a rack before freezing, and then wrap it very well with foil (we use two layers). Defrost the frozen roll ups overnight in the refrigerator and then bake, covered with aluminum foil, at 350 degrees F for about 20 minutes, uncover and cook until well heated through, about 20 more minutes. Mmm MMM!! THIS TASTED AWESOME!! I’m saving this recipe for next week. I want to make this often now!! THANK YOU THANK YOU THANK YOU Adam and Joanne. Love how you could print the recipe out! !